Every semester, I try to organize a sushi meet-up so the TAs in my office can meet and get to know each other. This time, however, my attempts to organize were more or less a fail. Despite drawing a huge availability schedule that spanned our chalkboard and personally bugging each TA to fill out the schedule, more than half of the TAs ended up cancelling hours before the dinner for various reasons. Somehow, 15 confirmed guests became 7, and plus-ones almost outnumbered TAs that actually share the office with me. Nonetheless, the dinner went on with Andrea, Angus, Anya, Ashton, Patrick, and Sean in attendance. Even though the restaurant still displays a "Grand Opening" sign, it has actually been open for many months. 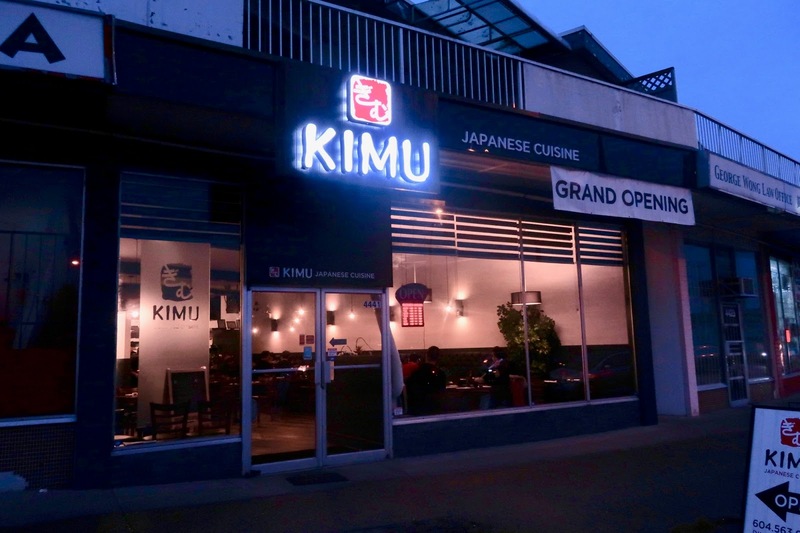 It has been gaining popularity, and now, it is one of my go-to places for casual group dinners. 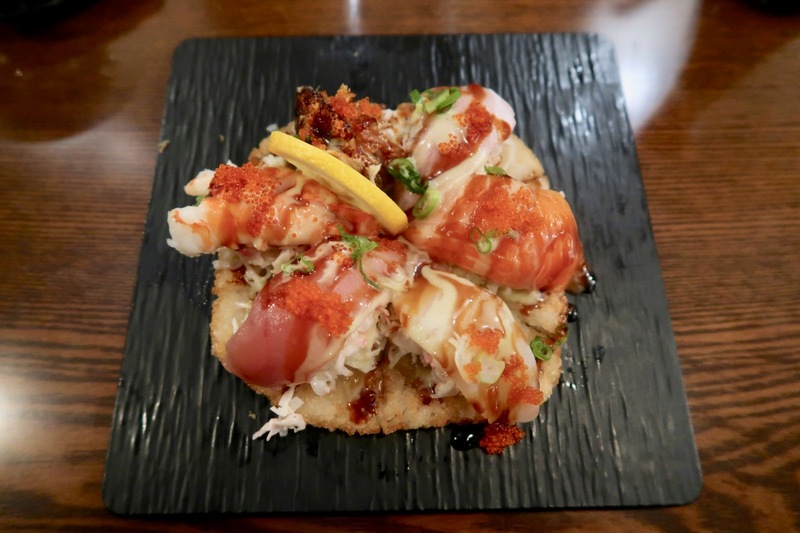 Their menu features a great assortment of fusion dishes, most of which are Instagram-worthy. As is usual for dinners with me, no ordering took place until around 45 minutes after we had sat down at our table, by which point the restaurant began to get busy and the service became sparse. We placed all our orders at the same time, but for some reason, my food came way later than anyone else's. After awkwardly staring at my friends enjoying their food for a very long time (some of them were already finished), my Belly King Roll finally arrived. This roll came with avocado, negitoro, seared sake toro (salmon belly), jalapeño, capers, garlic chips, balsamic reduction, and pesto olive sauce. 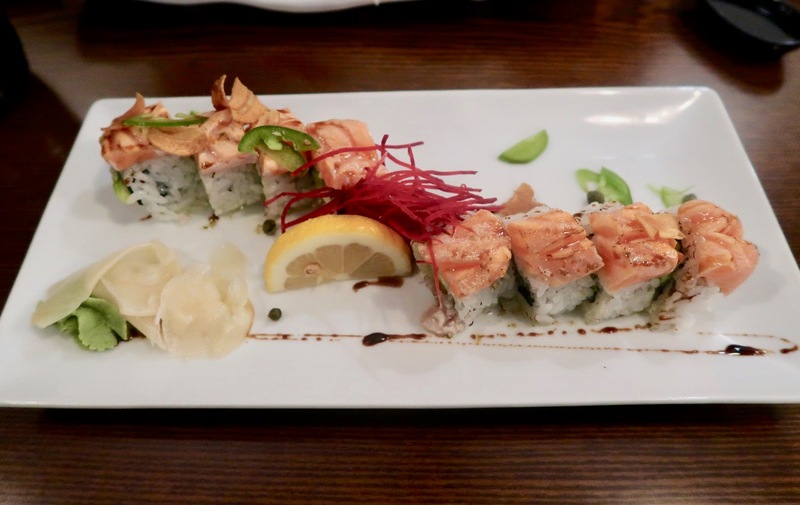 Despite its small size, the roll was very successful texture-wise, especially with the smooth and soft seared salmon. I thought the salmon could've used a bit more smokiness though. Since Sean was with us, we got the obligatory Spicy Crunch Roll. 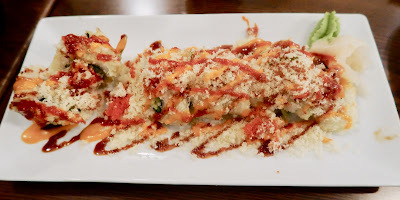 A deep-fried California roll topped with spicy tuna, tobiko, tempura flakes, spicy house sauce, and BBQ sauce, the Spicy Crunch Roll packed a lot of flavour, and it was nice that the batter was not too hard. The spicy tuna had a delectable, soft texture, but it was slightly overwhelmed by the aggressive use of chili sauce. Next, I had the Beef Gomae simply because I'd never seen the dish at any other restaurant before. It was essentially beef sashimi accompanied by gomae. The beef was tender and went well with the sweet gomae sauce, but the tangy ponzu sauce on the bottom complemented neither the beef nor the gomae. 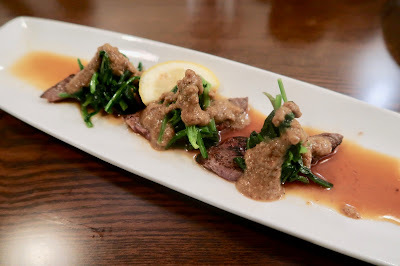 I had to let the ponzu sauce drip down before each bite. In honour of one of our guests, who really likes colourful things, I ordered the Rainbow Sushi Pizza, which came with crab meat, salmon, tuna, ebi, hamachi, tai, unagi, tobiko, BBQ eel, and wasabi mayonnaise. The crispy layer of rice at the bottom was slightly overdone, but the mixture of creamy sauces and smooth cuts of fish worked well. The tai and unagi were the highlights among the seafood. Ordering my nigiri turned out to be quite laughable for my entire table because they had run out of most of the more expensive types of nigiri. After having my order rejected again and again (feels bad), I finally ended up with the nigiri above. The nigiri was fresh and came in generous cuts. 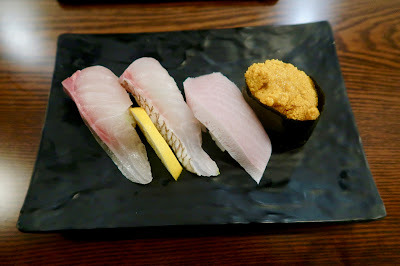 The delicate sweetness of the shima-aji and the smooth texture of the madai were highlights. There wasn't a lot of uni in the Uni Nigiri, but it still had a nice, creamy texture.